Hazel Run performs at Belmont to benefit FOR. 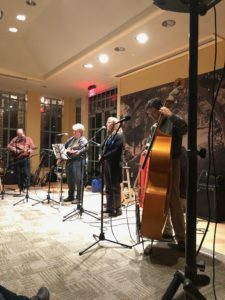 On the crisp evening of Nov. 17, 2018, Friends of the Rappahannock (FOR) and lovers of music gathered at the historic home of the artist Geri Melchers, Belmont, for a night of music with local band Hazel Run. The event was a benefit concert for FOR and the conclusion to a full year of community outreach and river support. Attendees were greeted at the door by community conservationist, Woodie Walker, and his team of volunteers from the University of Mary Washington, who had a display of information on FOR and the Rappahannock River for perusal. Event sponsors and VIP guests were able to enjoy beverages and light snacks while exploring the exhibit of Geri Melchers’ art before sitting down for an evening of wonderful music. The set list was a mix of “oldies but goodies” and originals written by the performers. Many songs were dedicated to the river that runs through downtown Fredericksburg, and paid tribute to the role it has played in the Fredericksburg community. The audience was enthralled with Hazel Run’s performance, oftentimes singing and clapping along. As for the band themselves, Hazel Run is a local group founded in Fredericksburg about two years ago. Specializing in Americana, soul and rock melodies, members Karen Richardson, Linda LaFave, Stephen Hu and Stuart Whitford filled the Studio Pavilion at Belmont with music as beautiful as the river. Hazel Run performed songs that reminded the audience of their relationship with the river and with harmonies that resembled those of groups past, such as Crosby, Still, Nash & Young, and Peter, Paul and Mary. Their love for the river was apparent to all in attendance, and spread through the room as their music filled the air. The evening was a wild success and was a perfect conclusion to FOR’s fundraising year. 2018 was a year full of community engagement, which is a key factor of FOR’s success. Without the Fredericksburg community, FOR would not be able to do all that they do to protect the Rappahannock. From fundraising events such as An Evening with Hazel Run and Riverfest, to river cleanups and tree planting days, the community has been involved in every step of the way. The continued support of FOR by the Fredericksburg and surrounding community is a sight to behold, especially in the eyes of one of their many interns. Working with Friends of the Rappahannock has been a wonderful experience throughout the past year. Between the many events I participated in and the people I have met along the way, it is clear that the Fredericksburg community cherishes the Rappahannock and is dedicated to protecting the river for years to come. Be sure to be on the lookout for their 2019 calendar of events for more opportunities to become involved with protecting, advocating for, and enjoying the wonderful resource that is the Rappahannock River. Fun Fact: The main character in the the song “The Weight” by The Band is named Fanny, not the often misheard lyric, Annie.